The unique design of the Onyx M-16 Belt Pack Manual Inflatable Life Jacket (PFD) keeps stand-up paddleboarders (SUP), anglers, boaters, and other paddlers safe without compromising movement! The 16 gram CO2 charge provides 17 lbs. of buoyancy and the oral inflation tube can be used to provide additional buoyancy up to 26.5 lbs. when fully inflated. It's low profile design is preferred by most stand up paddlers. 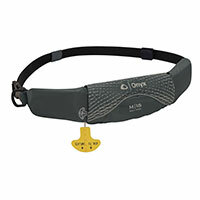 The 1” buckle and body belt is comfortable and adjustable. The D-ring attachment creates a a place for small accessories to be attached. The protective cover is constructed from 200 denier nylon oxford protective fabric. U.S. Coast Guard Type V, meets Coast Guard requirement for a Type III PFD when it is worn.